Well...I would have had more Sally Hansen Designer Collection swatches today, but then I had to go and get some good news. My roommate told me a couple of days ago that he's ok with the internet knowing that he's the one who's been in the hospital all of these times. I wrote about a "family member" and not a "relative" because we're not blood, but I love him like family. He's the closest thing I have to a kid (he considers my partner his surrogate father, so I'm his 'step-mom')...and he's coming home today! This time around was the most hopeful of the three and he's doing really great, considering. He'll be back home by the time this post goes up. Thanks again to everyone who's expressed concern and wished him well any or all of the three times. I couldn't think of anything to layer over Zoya Neve and I had just found L'Oreal The Temptress' Touch at Big Lots for next to nothing. It looked like it might stamp well, so I gave it a shot. The two colors clash a bit, but their finishes coordinate and I love how they look together. Neve is a bit less blue and more purple in person (indigos and cameras are not friends), so the contrast was a big stronger. The green really popped. 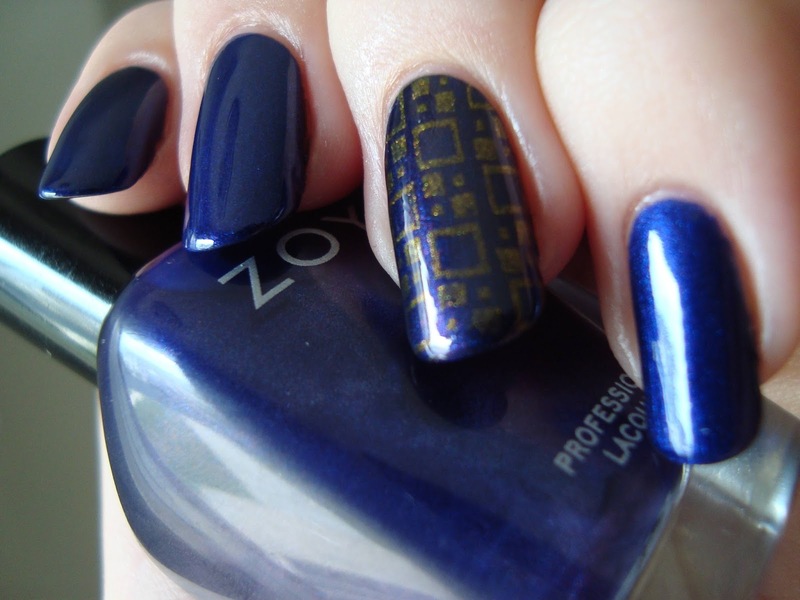 I feel like an idiot, but I really can't remember what I stamped Zoya Claudine with. I think it might have been SinfulShine Shine Divine. (I should have the Hot For Shine swatches up next week.) I looked through the bin of stuff I've either worn or bought recently and that was the only thing that came even close...so let's go with that. I wanted something subtle after the indigo and acid green pairing, and a simpler design. It was so subtle and simple that it was tough to photograph! It was easier to see it in person, but it still wasn't terribly obvious. I still liked it, even though it reminds me of rain boots. It's semi-intentionally on-trend for fall, but not as much as the next one. 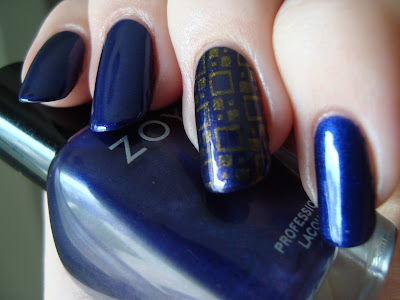 Military-inspired stuff is everywhere this season and I knew just what to do to add a little flair to Sally Hansen Loden Green before visiting Zeus in the hospital last night. I used another of the new Prabal Gurung shades, Coat Of Arms, to stamp something almost too appropriate for the trend. ...but my stamp placement needs work. Bleh. So...that last one was almost a swatch, wasn't it? Bit of a tease there, I know. I'll have it and the other two Prabal Gurung shades up in my first post next week. I'll have a new Slimdown Saturday post up tomorrow and maaaaaybe a nail post miiiiiight sneak in on Sunday, but I'm not sure yet. There's actually a ton of stuff in my photo selection folder if you want a very cluttered sneak peek. I'm so excited about some of this upcoming stuff! But for now...real life is claiming me for a little while. So happy that he's doing better again!